We're delighted for the opportunity to introduce you to St. John's Priory and The Community of Christ the Sower, North America. We are a religious institute tracing our roots to 1626 and the community founded by Nicholas Ferrar in Little Gidding England. St. John's Priory is a Chapter and Retreat House for The Community of Christ the Sower. 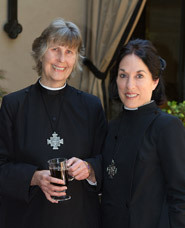 We are a contemplative Benedictine House and Quiet Garden located near San Francisco California. We pray the Lord will richly bless you for your interest in us, and that your time spent here will be Spirit-filled and fruitful. We invite you to peruse our website and get to know us better. We invite you to consider whether any of our programs or ministries could serve as an enrichment for your life. We invite you with the words of our Lord, "Come and See!"